Show me the money, faster. 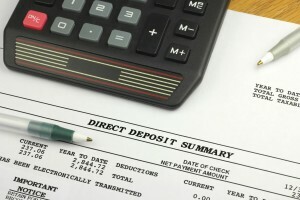 Hatboro Federal’s Direct Deposit service automatically deposits your paycheck, Social Security, pension, retirement plans, VA benefits, and other recurring or regular monthly income directly into your checking or savings account rather than receiving a paper check. It’s convenient. Payments are deposited automatically into your Hatboro Federal account even if you are too busy to get to the bank. It’s safe. You never have to worry about checks getting lost, delayed or stolen, and helps protect you from identity theft. It’s fast. Since deposits are made electronically, your funds are available to you much faster. Ask the company, business or agency who pays you if they offer Direct Deposit. Then just stop by any Hatboro Federal office and we’ll help you set up your account.